I’m really pleased to welcome Brian Stewart to the blog today as he shares TenThings about himself. 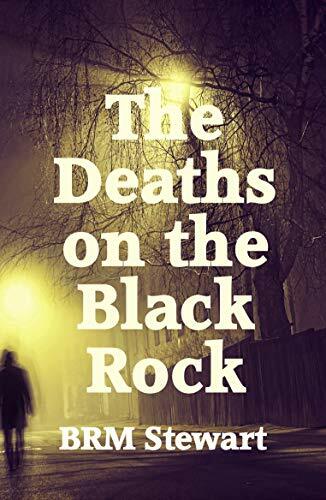 I heard him read from his novel, The Deaths on The Black Rock, at Noir at the Bar last November and it sounds a really gripping read. I was born in Rutherglen, brought up in Grangemouth, and then lived in Glasgow, Edinburgh and Nairn (for many years). We moved to Broughty Ferry in 2017 to be nearer our families. I have two grown-up children and two young grandsons. I am loving being a grandfather and being involved in their lives. I retired in 2015 from a lifetime working in education in several roles, including as a maths teacher and an OU maths tutor. I have a BSc from Glasgow University, and a teaching qualification from Jordanhill. While teaching, I gained a first class honours OU degree in maths. Some years later I obtained an MSc with the OU. As I was about to retire – and planning to get serious with my writing – I undertook a short OU course in creative writing. I owe the OU a lot! Through work and family connections over the years, I have travelled all over Scotland. I have been to Shetland, Orkney, the Borders, and all points in between. I have a particular affection for the Isle of Jura and its people, which I discovered through my wife’s historical family connections there. I was lucky enough to be shown round Barnhill, and tried to soak up as much atmosphere as I could. My wife and I enjoy holidays and travel. Highlights have included cycling in Alaska, swimming in the Blue Lagoon, and walking up to the top of Vesuvius. We have seen Uluru at dusk and dawn, swum in the Olympic pool under Sydney Harbour Bridge, and got soaked on the boat under Niagara Falls. The furthest north we have been is North Cape in Norway, furthest west is the Pacific coast of Vancouver Island, furthest east is Byron Bay, furthest south is Melbourne. But there are lots of places still to visit – China is next on our list! I try to keep fit, try to play golf, and try to play the guitar – no two of these at the same time. I am a member of the Broughty Ferry Rotary Club, which is very active in supporting the local and international community. I keep in touch with other writers on Twitter, and am a member of the Angus Writers’ Circle: they are an extremely supportive bunch of people, and all are talented writers working in different fields and genres. I tag along to the crime readers group at Waterstones Dundee (#tokenmale) where we read a book a month and then meet and chat to the author. Recently we met Olga Wojtas, Liam McIlvanney and ES Thomson. I always enjoy listening to authors talk about their lives and their writing. I’ve had various favourite authors over the years, but now I tend to have favourite books. A perfect book for me is one where you almost don’t see the writing: you see the world that’s in the book. It’s like a really good actor: you don’t see them act. So, recent years have given me His Bloody Project (Graeme Macrae Burnet), The Guilty One (Lisa Ballantyne), Little Black Lies (Sharon Bolton), Black Widow (Chris Brookmyre), The Land Agent (J David Simons), and Sweetland (Michael Crummey). From the distant past are Catch 22, Goldfinger (yes, I am a Bond fan), and Funeral In Berlin (yes, I love Len Deighton), and Arthur Conan Doyle’s Sherlock Holmes stories. But there are very many authors whose work is well worth reading, and it’s probably unfair and pointless to pick out the ‘best ones’. Brian RM Stewart was born in Rutherglen and grew up in Grangemouth. He attended Glasgow University and Jordanhill College of Education, taught in Edinburgh, then moved to Nairn where heand his now-late wife Jan raised their children. Brian now lives in Broughty Ferry with his wife Sally, where he is a member of the Angus Writers’ Circle and an active member of Rotary. Brian spent much of his working life teaching mathematics and computing, but is now partially retired and lectures for the OU. When not writing, Brian attempts to play golf and the guitar (though not at the same time), and is a keen Bridge player. He has published two previous novels, Digital Circumstances and Digital Investigation.